It’s been a week of firsts on Footy Boots. First to show you the official images of the Nike CTR360 Maestri, first to provide an in-depth wear test review of the boot and now, first again as we get the views of Cesc Fabregas who will be wearing the CTR360 from this weekend. As part of the VIP audience invited to the launch day of the CTR360, one of the highlights for us was listening to the Arsenal and Spain star who was actively involved with the evolution of the new football boot. Fabregas was on stage with his good friend and countryman, Sky Sports La Liga expert Guillem Balague who began with a few question’s about the boot itself. GB: Two of the key characteristics of your game are control and passing. Does it help to have Nike develop the CTR360 boots that are based on your style of play? CF: Definitely. I think now I’ve been training with them for a few weeks. 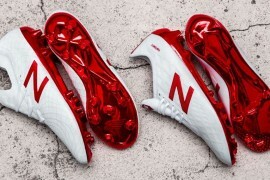 They feel really comfortable, and it’s great that they can do some special boots for players like me. We pass a lot the ball, with the internal part of the boot or the external part, and for the control it’s really good, so we are really pleased with it. GB: How does it help you to control the ball? CF: Well, it has some new things that they have introduced in the boot. Especially for when you kick the ball with the middle of the foot you don’t have the tongue there, you know, and they put some things in the external part as well for the control of the boot. It makes it softer, and I think it feels really good and I’m excited about playing with it. GB: One of the fascinating things about boots is that every player in different positions use different boots. Do you think that’s how it should be? CF: Well, yes I think so, because every player has different characteristics of play. You can have players like Theo (Walcott), you know, who is really quick, probably who will need a lighter boot. Me, I don’t need that. I will always be slow!. But every player is different, really. GB: Nike is presenting, an online training programme called Nike Football+, (read more on this at the foot of' the interview) and you’ve been involved in creating some of the content around a signature move, called a 180- degree cushioned turn. Can you tell us about the move? CF: Well, in midfield you need a lot of movement. You have to be asking for the ball all the time, looking for the ball, and in my position I have to be moving all the time. So you first move the defender outside, then you come back and ask for the ball. And in this one or two seconds that you win, you’ll create the time to turn on the ball. This allows you to get past your opponent because he lost those one or two seconds. After you can play your team mate in with a simple pass. GB: Football isn’t just something where you go out into the pitch and play. You have to practise these moves, don’t you? You have to work at it. CF: Yes, definitely. You always have a level of instinct, but definitely you have to train a lot. You have to know what you are doing, you have to know when you are doing it, and trying always to make the right decision is difficult. GB: Do you think the idea behind Nike Football+ is a good one where young footballers are able to insight and advice from players like yourself, Iniesta, and the Barcelona coaching staff? CF: Yes, it’s great, because I think if you look at professional footballers and they show you how to do things you can learn something from it, I think it’s really good. I used to do that as well, you know, when I was really young. And we are happy that we can help some young talented players as well. GB: What do you do specifically to train, and improve your touch and your control? CF: At Arsenal we do a lot of drills with mannequins. You know, always one twos, one-touch, control. The boss likes it a lot. We are a team that, of course knows where every player plays but if the striker can go in midfield, the midfielder can go as a striker. There’s always a lot of movement. GB: Do you use the space of the training pitch? CF: Yes, we play a lot of five against two, or sometimes you play seven against three, things like these, always in small places where you don’t have time to think. And it helps a lot after, when you’re in the game. GB: Is it fair to think that maybe young footballers don’t realise how much work you put into becoming you? CF: Well, yes. You have to have luck, definitely, but you have to spend a lot of hours training, improving at what you are maybe not as good, trying to be better at what you’re already good at. And yes, you have to have someone as well that tells you how to do it! GB: Because of the way you’ve developed and trained as a footballer you can play in different positions in midfield and even in the attack, and you do so with Spain. Which position do you prefer? CF: It is difficult. Probably the one I’m playing now is where I feel most comfortable. I’m still getting there, you know, to be at my best in that position. Because I think it’s different, when I started at Arsenal: we were playing 4-4-2, I was one of those two in the middle so I could come very deep to get the ball and when I was young it was really good for me because I had more time from deep positions to link with other players, to move forward from deep. Now my position is higher up on the pitch, sometimes I don’t touch the ball as often as I used to touch, so I have to be patient. But I know I’m in this part of the pitch where I can do dangerous things in terms of giving the final ball, and I have more time to go to dangerous positions, you know, to score a goal as well. I feel more freedom in that position. GB: You’ll be playing at Blackburn Rovers on 4th October. It’s the first time you’ll be using the boots in an official game. How important is it, both the touch and control, with teams that don’t give you much space? CF: It’s vital. Because when you play against teams like Blackburn, for example, they put a lot of pressure on you, especially in midfield. They know that if they let us play we can be dangerous, and it’s really difficult to play against them because they are always quick. They mark tight and if you are not quick with your feet and with your control it’s going to be difficult. Check out the CTR360 video here. For the first time ever Nike will deliver an enhanced product experience in football through the CTR360 Maestri football boot. October will see the launch of the Nike Football+ service. 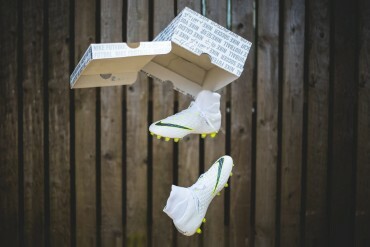 Included in all CTR360 Maestri boots will be a unique user code that when entered online at www.nikefootball.com will open up a realm of unique user content and tools designed to provide access and insight to the very elite level the game. The goal is simply to enable the passionate players to be better trained by directly delivering knowledge and content from the teams and athletes Nike partners with. It’s also to ensure athletes are better connected to each other and also their own data. More details around the specifics of Nike Football+ will be released in October. Ive got these great boots and tommorow the 4th of october im wearing them 4 the first time i bought them today the 3rd . 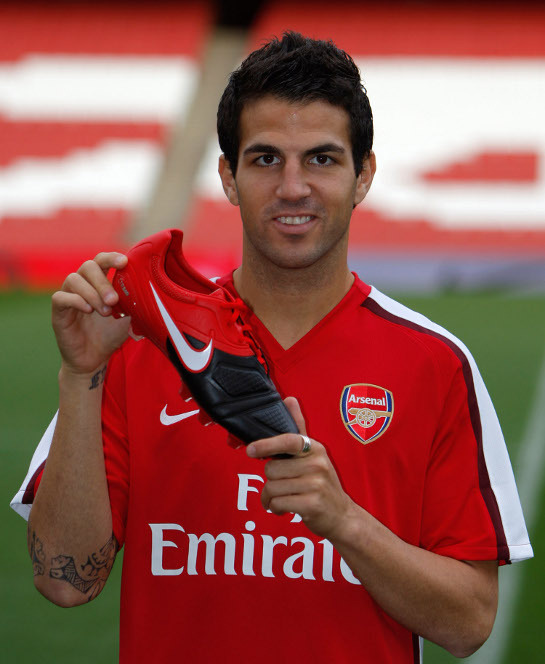 they look siik i cant wait 2 wear them .Arsenal rule my best players cesc fabragas and he wears them 4 arsenal !!! I hear the CTR360 trequartista is leather instead of kanga-lite. Is this true? kuuku: Yes, they are true leather instead of the synthetic. thanks for the info. Do you know of another differences? I am torn between shelling out the big bucks for the elite boot I might not need or getting the more suitable lower level boot that might lack features. What sizes do they come in?????? Really interesting interview. Excited about see Fabregas play in these now. Think the coverage of this boot and its release has been excellent on Footy Boots. CF comes across as a very decent bloke. Impressive interview seeing as it’s his 2nd language (and Guillem’s!!) Can’t see too many of our boys being able to sit there and converse in Spanish (French or German come to that). It will be interesting to see how Adidas respond… At the moment comic books aren’t appealing to me much. The match report for arsenal,6 blackburn,2 reads like an advertisement for this boot! Fabregas was passing like a god and even volleyed one in off the outside of his boot! for a goal. Big points for Fabregas, Arsenal, and Nike. reminds some of us boots lovers that the shoes isn’t everything.